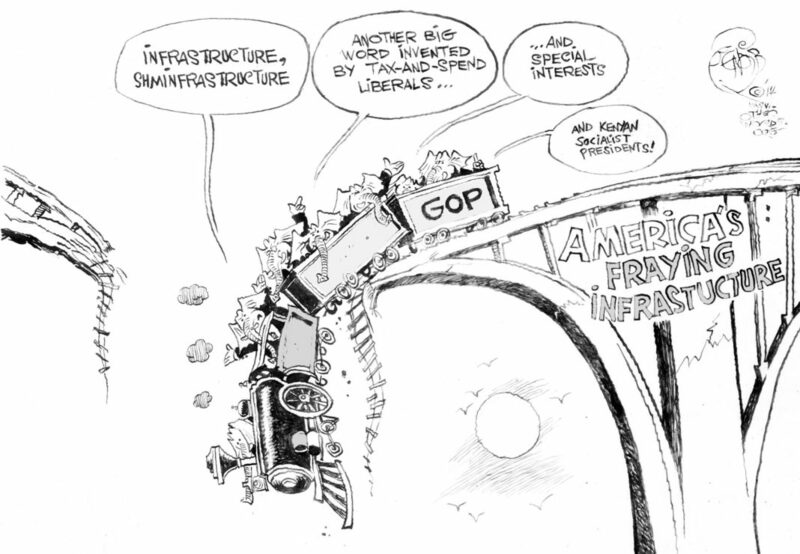 So how about that “Infrastructure Week” that wasn’t? It also resulted in the collapse of his would-be Advisory Council on Infrastructure before it managed even a single meeting. Infrastructure remains stuck near the rear of the legislative line, according to two dozen administration officials, legislators and labor leaders involved in coming up with a concrete proposal. 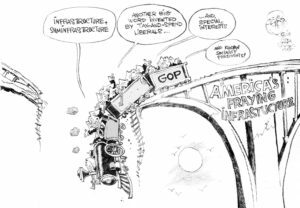 Trump’s ‘Great National Infrastructure Program’? Stalled. Folks, Time to study the for-profit prison industrial complex – “PRIVATE PRISONS: THE SECRETIVE $5 BILLION INDUSTRY GROWNING UNDER TRUMP” | the Inquirer and Daily News. “But a few weeks later, then-Deputy Attorney General Sally Yates issued a memo that directed the Bureau of Prisons to phase out its use of private-run prisons altogether. This was a potentially fatal blow to the industry; the stock price of publicly traded GEO plummeted 40 percent that day. Then history intervened. Since the election of President Trump, GEO — which donated $170,000 to a Trump political action committee last year, and $250,000 to his inaugural bash — has seen its stock price nearly quadruple. One of Attorney General Jeff Sessions’ first moves after taking office in February was to rescind Yates’ memo. Then their billionaires can buy up all the roads and bridges that we’ve been paying for, and before us our parents and grandparents, for decades. Then they’ll charge us to drive to our jobs, where they want to eliminate minimum wage and labor laws. Modern fascism comes with a corporate logo. Do you honestly think that billionaires think that small, Tom? Do you actually believe that thinking on a small scale like that is how they became billionaires? You are talking about small ideas with small returns and huge maintenance costs. There is a reason that government build and maintain infrastructure like roads…they are expensive and there isn’t much in the way of a return on your investment. 2) U.S. Gov generally guarantees the “private” bonds, so when the private partner goes bankrupt, taxpayers have to pay off the bonds, loans, and maintenance. 3) Bondholders receive double digit returns per year on their bonds. 4) Virtually all, if not all, of the private toll operators (that is, the shell companies created) go bankrupt within 15 years. 5) Average overestimate of revenues for each toll road for first five years of operation was more than double actual revenue. e.g. Washington D.C. Capital Beltway Express (CBE), a $1.5 billion dollar project. 39% of funding is U.S. Gov. insured bonds (paying 13%), another 39% is U.S. Gov. loan. Private money <6%. CBE was generating barely 20% of its traffic projection. That's a billion from the government on one project, and there are hundreds of such projects already. So maybe we should celebrate that we didn't get more…yet. Fact Checker 13, I genuinely appreciate your taking the time to explain what you did about private concerns having government backing not being a very good idea. I am fairly certain I agree with you about it being a bad idea for many reasons. What I don’t understand is how that relates to my original comment about billionaires trying to take roads and bridges away from the government into private ownership so they can charge us tolls to make themselves wealthier. Is there a connection between what you wrote and my original premise? My comments were directed to “how do billionaires enrich themselves (and why the stakes are high enough that they care) from public/private partnerships”, which I thought was your topic. In my mind, there is not a significant difference between building a new (probably unneeded) road/bridge and “refurbishing” an existing road/bridge–both generate bonds, loans, and tolls. Asset ownership is not the point–it is taking the money and running. My favorite privatization story is the Ambassador Bridge. There’s a new bridge proposed, Gordie Howe International Bridge, and it’s desperately needed to keep up with the increase in traffic on the Ambassador, but the private owner of the Ambassador Bridge has been fighting it, including some dirty tricks and an attempt to amend the states constitution. Forget what the public needs, it’s all about the profit, baby, screw the commuters and shippers. Funny how the right and the wealthy preach free enterprise, and then fight competition. Yes, billionaire Matty Moroun has himself quite a cash cow in that bridge. But it isn’t the bridge that makes his money…it is that duty free shop and the duty free gas he sells that puts about 60-cents per gallon in his pocket. The bridge barely breaks even each year. He has pulled some nasty tricks to keep control of the bridge and the traffic it brings, but there should be no surprise in that. He isn’t running a philanthropic organization. However, he pushed things too far and Canada is going to build a bridge to, if not take most of his traffic away, then at least take a significant portion away. They will also offer duty free shops and duty free fuel, but they will lower the price of the fuel rather than collect it. That will kill Matty’s cash cow, which sounds like a good thing to me. I have always thought that the nation’s infrastructure is best in the hands of goverment. As silly as government can be at times, it usually serves the public good better than private enterprise. Surprised I say that, Tom?